As soon as Dr. Ashcroft confirmed that he would meet with me on 22nd April, starting date as well as much of my route were finalized. It also meant that I had to quicken the pace of packing all the stuff I had accumulated. For once, I decided to explore the options of packing materials and thanks to dear friend Frank [Middletown, NJ], I found fairly economical pricing [significantly cheaper than UPS] for boxes from U-Haul. Folks from Alpha Moving & Storage showed up on time, as promised, and were very professional, quick & diligent in their work. I felt ashamed, to an extent, as I took just about the same amount of time to load random stuff into my car as they had taken to pack an entire apartment into their truck. Given that I had moved less than 15 months ago, I should have paid extra attention to accumulation of stuff – but it was yet another lesson in life that I hope not to forget. Running errands [returning unused boxes to U-Haul, getting a copy of auto insurance, etc.] took a while and I did enjoy one last good [home cooked] meal at Batman residence (@dataguru61). As planned, the last stop in New Jersey was at Coach Lombardi’s Grave. Barring about a mile long bumper-to-bumper traffic somewhere along I-80W, most of 265 mile drive was very smooth. I just wish every segment of the rest of this journey is just as smooth. Passing through the township of Scranton, PA and discussing [more like learning, to be precise] the concept of Universal Art and the underlying advaita philosophy (as mentioned in my recent reading, hamsageete by ta. ra. su. – thanks Vathsa, Latha for letting me borrow that book) with Deepti (@deepgemini) were the highlights of this stretch. Heavy rains and the hills/valley geography made the last 10 miles or so seem a bit longer but I reached Ithaca, NY, safe. The Candlestickmaker intertwines astrophysics, the aspirations of an Indian family and lore into a captivating performance. Set in a family home of the Nobel Prize winning astrophysicist Subrahmanyan Chandrasekhar, who discovered the theory behind black holes, the play follows the story of three main characters. Sunil, a young Indian New Zealand university student, who has set out with his Lonely Planet in hand to visit his Uncle CJ Rohan in southern India. CJ Rohan is a retired university lecturer who is awaiting the arrival of his esteemed uncle, Subrahmanyan Chandrasekhar (known in America as the candlestickmaker). The superstitious Rohan hopes to gain his unclesâ€™ recognition for his lifeâ€™s work, a paper blithely setting out to explain the importance of whatâ€™s in a name. And finally, Kilayani, the three hundred year old cook who also serves as living memory of this familyâ€™s history. Kilayani has been witness to the families coming and goings for seemingly centuries and is now awaiting the return of her love foretold. Jacob Rohan deftly plays all characters; through the frenetic changing of character through mask, he draws the audience in from the beginning. Rohan is joined on stage by a musician and a silent actor who is also puppeteer to an English speaking, Hungarian singing duck. These colourful threads of the performance are brought together by a stunning and versatile set. Tall, willowy lengths of bamboo from which woven candlelit baskets hang tower from one side of the stage, overhead, props are suspended from boards suspended by a rope and pulley system which is anchored down to the opposite side. It is amongst these ropes where the musician sits alternating between providing musical accompaniments and manipulating the pulley setting. Initially, the set with ropes and poles joined from one side to another, is reminiscent of the deck of a tall ship and the performers the crew for the journey. The Candlestickmaker offers the audience insight into many journeys, the physical, the mythical, emotional, cross-cultural and scientific. By being instantly and convincingly transported to southern India, Rohan, invites the audience into a tale where the mythical and the real are meshed. A journey which seems more familiar than not, yet one knows that by the interval, there must be an impending disaster, a disruption in the chain of events. To formulaic perfection, the tale follows the science, as slowly the plans and desires of the CJ Rohan, Sunil and Kilayani begin to implode in the second act as the decisions and actions of each character imposes upon the others, resulting in a classic comedic tragedy. For the next four hours or so, I ended up hiking parts / outskirts of Ithaca – meeting fellow Patriots in College Town Bagels [needless to mention the bagels were delicious] and checking out Buttermilk Falls, Old Mill Falls, Lucifer Falls and Taughannock Falls. If what I got to see in these four hours is just a trailer of what this area [upstate New York] has to offer, I would certainly love to visit it again at leisure. Given the way Ithaca is geographically designed, it wasn’t too long before I realized that you are either going up or going down; and once you are on a flat road, you are probably out of it. And I used the same theory to confirm that I was out of the city limits. Knowing that I would spend quite a lot of time had I entered Watkins Glen, I decided to skip it – so that I could reach Penn State as originally planned. Just as in the previous segment, I only had to face about a mile’s worth of slow traffic along US-15 – near NY-PA border – and couple other slow downs due to ongoing construction work. Somewhere along US-220, I did see Sunshine in my rear view mirror while thunderstorms were waiting ahead. Wish I had more time [and wish I was on a non-highway] to stop and take pictures of it. All said and done, it was a no-complaint ride and I reached State College around 6:45pm – and for the record, I tweeted at quite an annoying rate all along this drive. The next two days or so were spent hanging out/hiking with dear friends from Penn State University – Shivu (@pionshivu), Mahesh (@mahesh_shastry), Harisha, Umesh, Vipul, Vikas (@vikasargod), Sanghamitra, Piali; a good 45 minute long discussion about some aspects of educational technology with Cole (@colecamplese) [who I had met earlier at WordCampEd] and Allan (@agyorke); following that discussion with couple more – first with Nolen (an MTU alum, current PSU grad) about non commutative geometry and then with Shivu & Mahesh about RSA & factoring primes; photographing parts of Penn State campus that I had not done previously. While this showed me that I need to do my geographical research well and that I should keep the maps on my GPS updated, biggest takeaway was that I should test my common-sense before trusting it. Rest of the journey, once I found I-80, was fairly smooth as it has been so far. Only modification to the travel plan was that I decided not to deviate towards Canton, OH – the home of NFL Hall of Fame. From my [later] understandings of Peter‘s (@techieb0y) Theory of Interstate Travels, I realized that having a Garden State license plate while driving through Ohio was not a bad thing at all – I could zip through at/around 80mph and still not even be warned by the highway cops [as had happened over a year ago, when I was driving the other way with Michigan license plate]. If you are new to this rivalry, may be you should read this or see this. Within about two hours of reaching Belleville, MI, we [Chong (@bigmaninjapan), Jess (@shorty_stylee) and Ryan (@bigryanb)] headed out to the Corner Brewery in Ypsilanti – to attend the Jaunty Release Party. From what I gathered, there were more people than expected [which was good]; I got to meet few old acquaintances and enjoy good food; what I didn’t expect was to be buzzed by the very first serving of Hard Apple Cider, but that didn’t stop me from having two more through the course of the evening! Following sound sleep at Tim-Jess residence and a good Sunday brunch with Chong (@bigmaninjapan), Jess (@shorty_stylee), Jaskie (@ajjaskie) and Jon (@nuxi) at Fleetwood Diner in Ann Arbor, MI, these folks took me to my first sighting of The Big House – which apparently was under construction to regain its rightful title. Just like the previous three segments of this journey, this one too was uneventful – the only traffic log/jam being on I-75S. Within about three hours of starting the drive, I was at Kyle‘s (@kwschnei) parents’ place in Rose City, MI. After relaxing for a while, Kyle’s dad took me around to see an eagle’s nest and the famous Shoe Tree in St. Helen. Kyle’s dad had taken Monday off to show me around the area and when he said we would be visiting Tawas City area, I shot an email to a dear friend to see if we could meet and she gladly obliged. Following breakfast at Sunrise Cafe in Lupton (an area that Arthur Godfrey used as a hangout – thanks Mitch for the information), we shot pictures of Tawas Point Light House, hiked a bit along the Lake Huron shore and then met with Penny at Tim Hortons for coffee. She was kind enough to take us to the Chamber of Commerce, pick maps and draw out a route for rest of our day. Waking up early, I followed Kyle’s dad to St. Helen and must have seen at least 50 deer in about 20 mile drive. 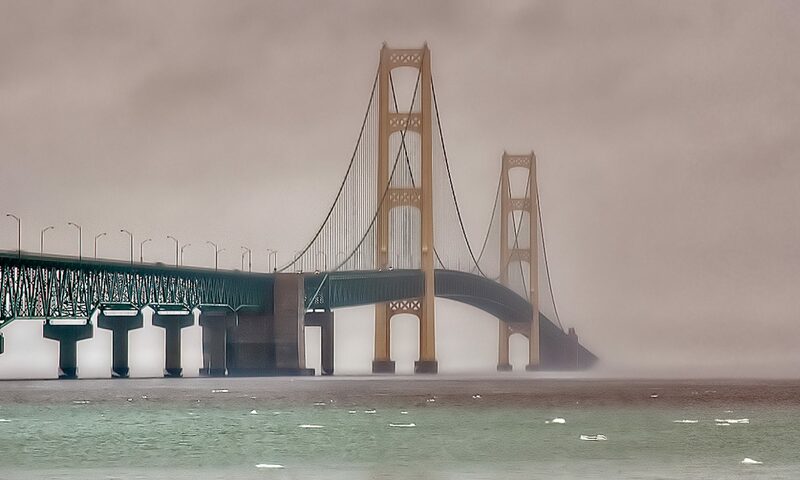 After getting my coffee-fix and making sure my car didn’t starve either, I set out with plans of making to the Mackinac Bridge in time to get pre- and post-sunrsie shots. Though I was late by just a few minutes to shoot the darker sky shot, I did get a decent shot as the sky was lighting up. Old Mackinac Point Lighthouse was a bonus! Upon crossing the bridge while watching Sunrise and eating Blueberry muffins [that Kyle’s mom had prepared], I headed towards Whitefish Point and then to Tahquamenon Falls. In spite of all prayers and requests, weather gods didn’t seem to be co-operating and with weathermen predicting similar conditions for next 48 hours or so, I didn’t seen any point in making an overnight stay at Munising. Instead, 225 miles later, I was in Houghton, MI – around 3:00pm local time. I am hoping to be able to make it up to the UP over the 4th of July. How long are you going to be there? G- Nice trip notes. Good to see you made it back to the good old UP safe and sound. Now all I have to do it make my short little trip up from Sconnie to see yah! Have been thinking of saying something apt ever since you wrote it. All I can come up with is, “Welcome back home”. I know how much you were looking forward to this, so am very happy for you. The pictures are wonderful, as usual.